Red Ball is back and better than ever in the second edition of the game, Red Ball 2! This time, players are tasked with searching for and finding Red Ball’s missing crown, which was lost during a sudden wind storm. Search high and low, on land and in water to find the King’s missing crown and win the day! Do you think you can handle it? Play now! The game begins with a cute cartoon story. Red Ball has become King of the land, enjoying a bright, sunny afternoon strolling through his kingdom when a terrible, sudden windstorm took him by surprise! As he was swept up and carried through the wind, he lost one of his most precious belongings – his crown. 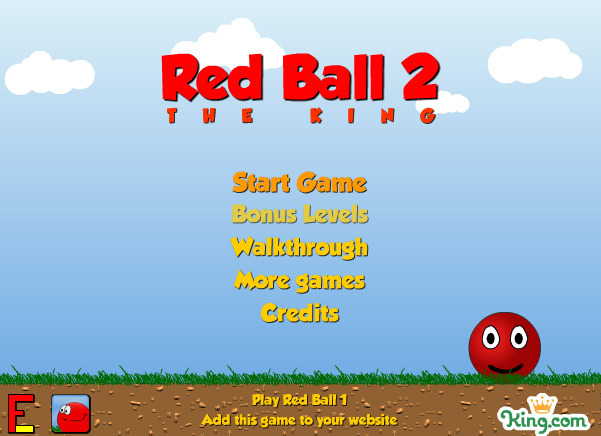 Players are tasked with completing multiple levels in Red Ball 2 in order to find King Red Ball’s crown. 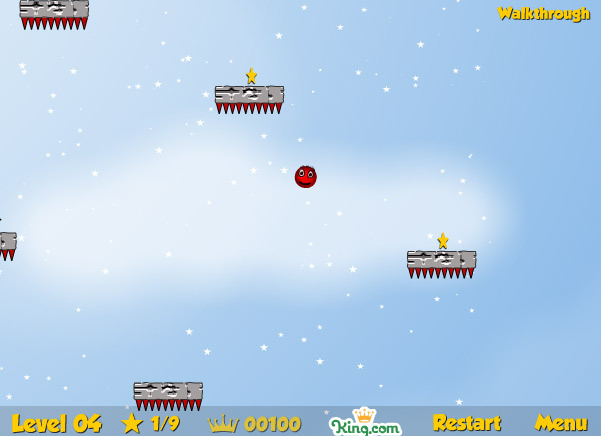 Players can easily guide Red Ball through each challenging level by using various keys on their keyboard. 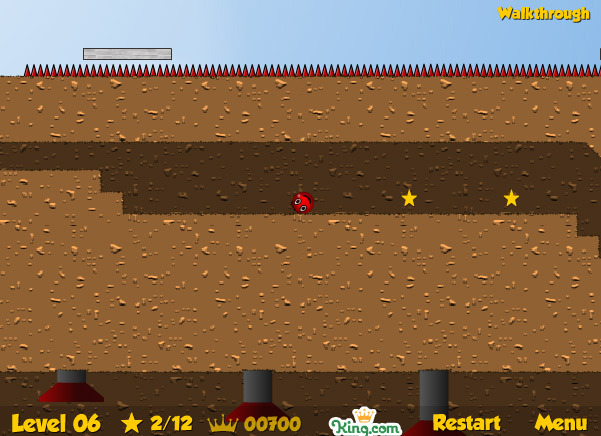 For instance, by pressing the left and right arrow key, you can move Red Ball to the left or right. 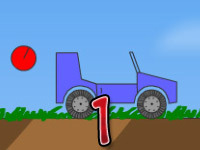 Pressing the up arrow key will make the ball jump, and pressing the down arrow key will cause him to come to a screeching halt. In addition, Pressing the R key will allow you to easily reset the desired level, and pressing the P key will pause the game and load a menu screen. 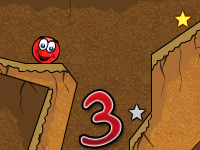 Red Ball 2 features 20 new levels; each level becomes significantly more difficult than the last. The first three levels are designed as tutorial levels to teach new players the primary key controls to help them learn the game. 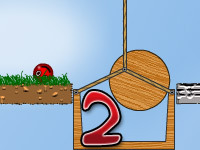 For instance, in level one, players will learn how to move Red Ball from left to right as well as jump from platform to platform and over obstacles. In level two, players learn how to jump and control the ball while jumping and floating through the air. Level three teaches you how to manipulate certain objects in order to advance through the level, such as moving solid boxes to jump to higher platforms. As you progress through each level, you also need to collect stars along the way. In order to pass each level, you will need to collect a certain amount of stars; you may make it to the end of the level, but if you don’t have all the required stars collected, you won’t complete it! Each level requires a different amount of stars collected. Here’s an example of the various amounts you may be required to collect for each level. If you’ve played the original Red Ball game, then you may remember some of the various obstacles that you came across, such as the Funny Ball, Train, and Lifts & Thorns. 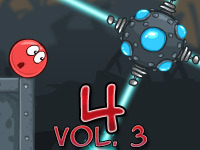 In Red Ball 2, you will see many of these same obstacles, as well as some new ones that you may be unfamiliar with. In this version, players can also float through the air and dive underwater in order to collect stars, but be careful! Those nasty thorns are everywhere! Are you stuck on a particular level? Don’t stress! There are tons of video walkthroughs available on the internet for you to watch and learn from, many of which can be found on YouTube!